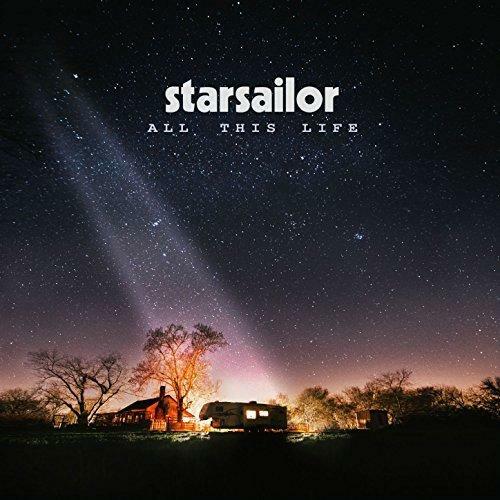 Glasgowmusic.co.uk - Review : "Starsailor - All This Life"
"Starsailor return with All This Life, their first album in eight years." All This Life is the first release of new material from Starsailor since emerging from a brief hiatus in 2014. Having now established themselves as a household name, the four-piece are approaching their twentieth anniversary together. Starsailors appeal has always been their sincerity, and have always been held in high regard alongside the likes of Travis, Doves and Embrace (whose guitarist Rick McNamara is, incidentally, on production duties) in the upper echelons of what could be described as post-Britpop. Lead single Listen To Your Heart kicks off proceedings, sounding like a band who have been re-energised after their break with the atmospheric intro leading into an absolutely stratospheric chorus. This is only bettered by Best Of Me, which would have been tailor-made for being belted out at festivals, had the album been released a couple of months earlier. Its definitive Starsailor, and shows from the off that they havent lost what made them so revered in the first place. Sunday Best also shows what Starsailor do best - heartfelt ballads which resonate with modern day life. Lead singer and lyricist James Walsh famously sang; "dont you know youve got your Daddys eyes, Daddy was an alcoholic" to give the band their first top ten single, and on this, Walsh again sings from personal experience of a relationship withering away - "As we get older, must we get colder, we are still glistening, if only you were listening". With the big choruses, and the intricate, beautiful balladry, comes the bland. The biggest criticism of the band throughout their career has been their tendency to veer into middle of the road territory, and they still do not manage to avoid doing so on this, their comeback. Blood is instantly forgettable while the title track is, somewhat ironically, lifeless and seems written with the sole intention of scraping onto the Radio 2 playlist. Despite this, there are several genuinely excellent tracks, which usually come when the band attempt something different. Fallout is a tense, frantic affair that leads to an electric guitar solo from frontman Walsh, while Take A Little Time focuses on a melodic groove led by haunting vocal harmonies. All This Life proves itself to be a quintessentially Starsailor record. It wont necessarily will over many new fans, but will no doubt please Starsailors largely devoted following (its easy to forget that for a period in the early 2000s, Starsailor were one of the biggest bands in the country). Despite playing it safe for the majority, the quartet provide enough variation to keep things interesting, and ensure that they will be sticking around for a long time yet. All This Life is released on September 1st. Starsailor tour the UK in October, calling at the ABC, Glasgow on October 22nd. This review has been viewed 3071 times.